Five years after doctors asked his parents whether they really wanted an ‘intolerable life’ for their son Pádraig (now 27) he returns with his parents and closest friend to Cape Cod to ‘walk’, in his wheelchair, the last mile to Route 6A in Brewster where that catastrophic accident changed his life. Irishman Pádraig Schäler (27) and his parents, Patricia O’Byrne and Reinhard Schäler, together with Cian Waters, one of his closest friends, will cross the Atlantic for the first time since Pádraig was hit by a van trying to overtake him as he cycled to work at 10am on June, 27, 2013. Prior to walking the ‘last mile’ from the Brewster Police Department on 631 Harwich Road to the spot of the accident near 2019 Main Street, Brewster, they hope to meet Attorney General Maura Healy in Boston to receive an update on the investigation into the serious issues they raised in relation to the accident investigation. · Repeat their call for a programme of driver education on the Cape and an initiative to make adequate insurance cover for drivers obligatory. They were horrified to hear a police officer still at the accident spot on that day five years ago telling them over the phone that “he cycled out in front of a van”, and just a few hours later reading on the internet about what sounded like a conclusive police statement blaming their son not only for the accident but also for the horrific head injuries he suffered – pre-empting the results of what should have been a thorough traffic accident investigation. They were shocked to hear that their son’s cell phone was confiscated by the police to be examined and even his bicycle taken in for examination, when neither the driver of the van, nor his cell phone, nor the van itself were checked by the police. The van, in fact, was brought to a garage that same afternoon by the driver. Despite the gravity of the accident, no significant outside resources were called in to assist with the accident investigation. The parents were astonished to be told by the Police Department that such accidents sadly happen every summer involving ‘foreign cyclists unfamiliar with the rules of the road, wearing dark clothing, wobbling along on the wrong side of the road’ – again apparently blaming their son for the accident. Their son Pádraig was a very experienced cyclist who had not just undergone formal cycle training in Germany, he had also cycled extensively in Europe, including the length of the Italian peninsula. While Pádraig still requires 24-hour care and extensive ongoing neuro-rehabilitation, while he is still unable to speak or to control his body, he has made amazing progress over the past five years, thanks to an extensive neuro rehabilitation programme largely financed by his family and friends, and, above all, to his unbroken desire to live and to enjoy life as best as he can – even under very difficult circumstances. Pádraig has travelled the “Camino” to Santiago de Compostela in Spain, participates in regular swimming sessions (he was an Irish champion swimmer), and continues going out with his friends as much as possible. The financial cost of this accident to Pádraig has been estimated by independent experts to be around $12 million – nowhere near the value of the drivers insurance policy, even if it that had been fully paid. · Join Pádraig, his parents, and one of his closest friends at 09:00 on 27 June 2018 for their ‘Walk for Life’ from the Brewster Police Department to 2019 Main Street, Brewster. Let them know you’ll be joining them here. · Support their call for better road safety driver education and un-biased accident investigation by writing to the Attorney General and the Governor of Massachusetts. 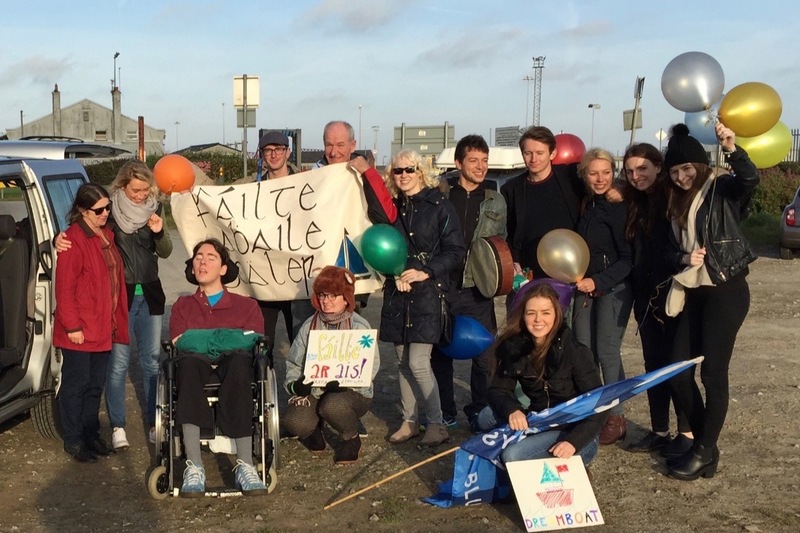 · Help Pádraig’s family and friends to cover his life-long specialised neurological rehabilitation programme by kindly making a donation.